The Campus Kitchen at Northwestern University (CKNU) is one of the largest chapters of The Campus Kitchens Project, a national organization that empowers student volunteers to fight food waste and hunger. Campus Kitchens across the country recover food that would have otherwise gone to waste and utilize unused kitchen space during off-hours to prepare healthy meals for those in need. Student volunteers with The Campus Kitchens Project go beyond providing meals by using food as a tool to promote poverty solutions, implement garden initiatives, participate in nutrition education, and convene food policy events. We work very closely with Sodexo and Northwestern Dining Services to serve over 34,000 meals each year to those in need in the Evanston community. Every summer, we partner with Sodexo as part of their Feeding our Future program, which helps us to ramp up our meal service in the summer months when so many students who typically receive free and reduced price meals at school end up at risk for hunger, this summer alone we served almost 18,000 meals. The Feeding Our Future program fills the summer nutrition gap and highlights healthy eating and basic nutrition lessons for youth during a time when many are unable to access free or reduced-price meals in school. 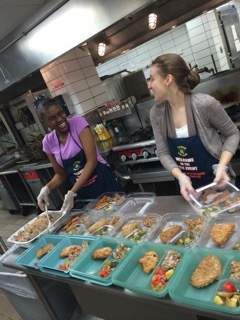 In partnership with Northwestern University’s food service provider Sodexo, student and community volunteers at CKNU prepare meals for those in need throughout Evanston and Chicago during the summer months. Some of the partner agencies that receive our meals include Salvation Army, Asian Youth Services, Family Focus, Youth and Opportunity United (Y.O.U. ), Fleetwood Jourdain, La Casa Norte, Stand Up for Kids, Broadway Youth Center, and YWCA. In the last academic year, Campus Kitchens across the country rescued 969,093 pounds of food that would otherwise have gone to waste, and served 309,283 meals to 15,310 clients struggling with food insecurity. But we know we can’t end hunger with food alone. At the Campus Kitchen at Northwestern University, we’re also engaging youth in nutrition education classes, including a series of lessons that take place in the garden, to encourage healthy eating and an understanding of sustainable food systems. We believe no food should go to waste when people are hungry. Each university is a part of its surrounding community, and with our help, we can transform them into a place where extra resources are put to good use for the community’s benefit. At the same time, the student volunteers who are involved in The Campus Kitchens Project are learning to identify sustainable solutions to food waste and hunger, and becoming the next generation of leaders. Thanks to our partners like Sodexo, The Campus Kitchens Project continues to grow, with 45 locations nationwide, and over 300 interested schools working with us to bring this innovative program to their campus. To learn how your organization can be involved in our local efforts, contact CKNU Coordinator, Samantha Warren at swarren@campuskitchens.org. 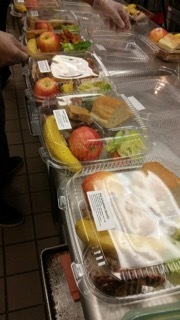 To learn more about The Campus Kitchens Project, visit www.campuskitchens.org. To learn more about Sodexo and the Feeding our Future program, visit www.sodexofoundation.org.